For the safety and convenience of ambulance service users, the TFD established the system to give guidance to and authorize private non-emergency ambulance service providers. In October 2007, this system was given a legal basis in the new ordinance “Tokyo Fire Department’s Authorization and Indication System for Private Non-Emergency Ambulance Providers.” The quality of the service providers is secured through crew training and the inspection of the vehicles used to ensure safety and security for users. In addition, there is the agreement concluded between the Tokyo Private Ambulance Call Center and the Tokyo Fire Department (“The Agreement on the Victim Transportation after Mass-Casualty Incidents Including Earthquakes”) to have sufficient ambulances for mass-casualty disasters. As of the end of March 2016, the TFD certified 249private non-emergency ambulance operators and 362private ambulances. In February 2005, the private ambulances for wheelchairs also started to be certified for more efficient service. I’m okay, but … I want the car! What if you are not badly hurt, but want a transportation service to the hospital? 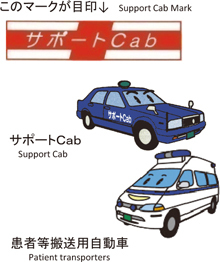 Call the Tokyo Private Ambulance Call Center for an ambulance or first aider-driven “Support Cab” taxi. Other Hours/Days : Recorded voice guidance takes your call.